Several grill makers have taken on the idea of the gas/charcoal grill hybrid, and this is Char-Broil's entry into the market. Like those made by other grill makers, the Char-Broil Combination Gas/Charcoal grill is basically two grills mounted on one cart (and running 5 1/2 feet end-to-end). On the gas side you get a somewhat-underpowered three-burner gas grill, and on the other a standard, box-style charcoal grill. With a 12,000-BTU side burner, you get a versatile grill in a package that was running for less than $500 as of Feb. 2018. The question you have to ask yourself is whether a unit like this really meet your needs. This version of the dual function grill is available on Amazon and direct from Char-Broil online. This grill could seem to be the answer to your grilling dilemmas: You have a gas grill you can fire up after you get home from work at night and a charcoal grill you can light for a weekend cookout. You also get a side burner for heating a pot or cooking bacon. The question is whether you want all of that in a single unit, since if part of the grill fails, you end up with 5 1/2 feet of grill that is only partially useful. 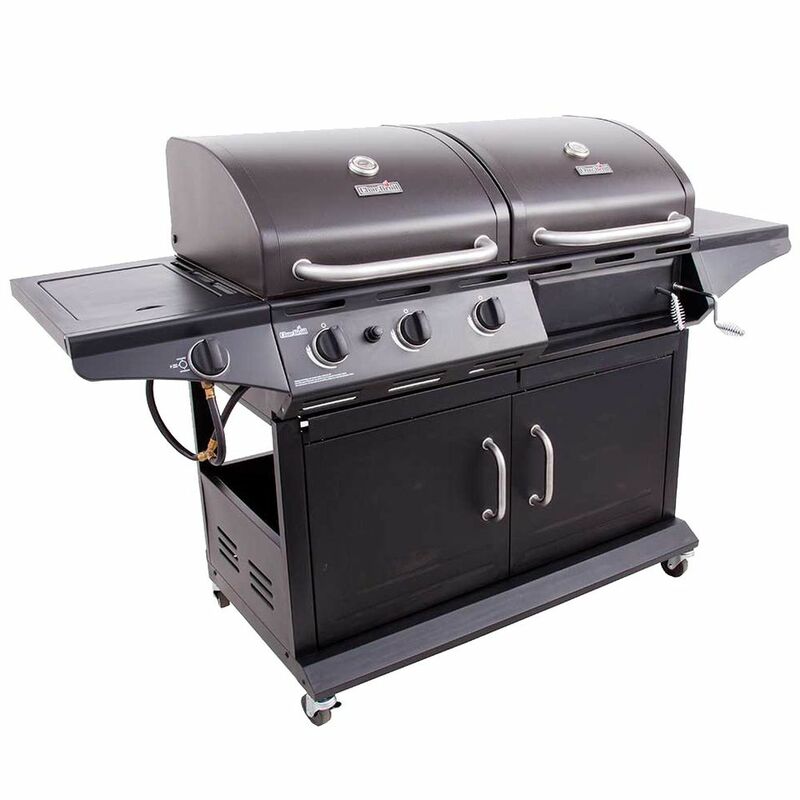 The gas grill side is a 36,000-BTU three-burner gas grill with medium-weight porcelain-coated cast-iron cooking grates and a 12,000-BTU side burner. While some of these components are not the best quality, they are not necessarily that bad for the price. The BTU output is a little low for the size, but the grill will heat well enough to give you some good grilling power. Other than this, it is a typical low-cost gas grill. On the charcoal side, you get a square box-style charcoal grill. The porcelain-coated steel-wire cooking grates are not going to transfer heat and are only good for keeping your food from falling into the fire. While relatively small, this charcoal grill gives you enough room for many grilling tasks but is limited in indirect grilling space. If you do need both a charcoal and gas grill but don't want to worry about part of the product potentially failing, you could purchase a Weber Kettle that will last you a good decade and perhaps a lower-end Char-Broil Gas Grill that will last a few years.